Kenneth Cole sale sparks Arab Spring? 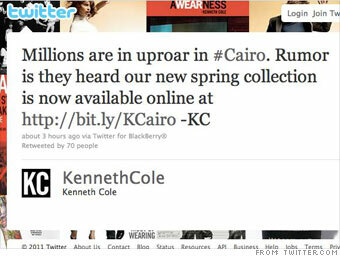 Kenneth Cole committed quite the faux pas when he used the unrest in Egypt to plug his latest collection on Twitter. "Millions are in uproar in #Cairo. Rumor is they heard our new spring collection is now available online -- KC," quipped the fashion house's namesake chairman in February, as protests in Egypt's Tahrir Square escalated. Cole apologized for the misguided tweet on both Twitter and Facebook within hours, saying that he wasn't "intending to make light of a serious situation." The gaffe ignited a media firestorm, and the Twittersphere snapped back with the hashtag #boycottKennethCole. Others created a satirical @KennethColePR account and tweeted equally uncouth but fake ads like "People from New Orleans are flooding into Kenneth Cole stores!" and "Wardrobe got you water-BORED? GITMO of our new spring collection," according to the Huffington Post.